Caribou in this area are today known as the Mulchatna Caribou Herd (MCH) and take their name from their identified traditional calving grounds: the upper Mulchatna River region in Alaska Game Management Unit (GMU) 17B. During the latter half of the 20th century, the MCH population began to grow substantially, becoming an easily obtained resource for residents of the Stony River, Lake Clark, Nushagak River, Iliamna Lake, and Bristol Bay areas, and also for nonlocal hunters from Alaska’s urban areas. In the mid-1990s, the caribou population peaked at about 200,000 animals, and then the herd began simultaneously declining and expanding its range north and west. During the 1970s, the MCH range was approximately 20,000 square miles. By the 2000s, its range had expanded to more than 60,000 square miles. Through this movement, a substantial portion of the herd became available to residents of the western side of the range, and communities in the western portion of the range have taken most of the subsistence harvest since the range expansion event. Notwithstanding, during our current decade the population reached a low of approximately 18,000 caribou; although in 2015 it had shown an increase to over 30,000. During the late 1990’s, reported annual harvests peaked at over 5,000 caribou but during the 2010’s, the reported harvest has not exceeded 466 caribou per year[iv]. Under this background, this article will highlight some of the results from a 2016-2018 Alaska Department of Fish and Game Division of Subsistence study, funded by the Western Alaska Landscape Conservation Cooperative[v] (WALCC) and assisted by Bristol Bay Native Association and Lake Clark National Park, which sought to understand the dynamics of the MCH from the perspective of local and traditional ecological knowledge (TEK). The project goals were to document TEK of caribou distribution over the previous 55 years with particular attention to environmental change; to document shifts in subsistence uses of caribou by local residents, particularly related to access and transportation methods; and to understand local residents’ capacity to adapt to ecological change, particularly in regard to shifting caribou distribution. The project’s primary objectives were to gather spatial information on MCH ecology and subsistence uses in order to produce a detailed map series, which visually displays TEK observations, and to integrate local and scientific knowledge to gain better insight into observed patterns of change. A total of 32 knowledgeable hunters and elders were interviewed from 13 communities within the range of the MCH. The communities were Dillingham, Ekwok, New Stuyahok, Igiugig, Koliganek, Nondalton, Lime Village, Stony River, Napaimute, Kwethluk, Bethel, Eek, and Togiak (Figure 1). Our primary field method was participatory landscape mapping, working with knowledge holders to record geospatially specific local knowledge. While information was recorded going as far back in time as respondents could provide, 1960 was established as the most realistic starting point for our geospatial inquiries. The overarching theme of the interviews was to ask respondents, “Over the past 5 decades, what is the local knowledge of the MCH in relationship to: abundance, distribution, seasonal movements, calving, bull/cow specific observations, vegetation establishment, landscape hydrology, disturbances (such as wildfire), weather and snow conditions, other wildlife, hunting locations, hunting strategies, and access?” A total of 105 field maps were produced from those interviews. In order to cover the established five-and-a-half decade study timeframe, all mapped data was recorded according to its relevant decade. To ensure coverage of the full timespan and the full scope of ecological and subsistence variables, multiple field maps were brought to each interview, including maps to cover different spatial scales. Our TEK mapping obtained a suite of coded geospatial data, or ‘puzzle pieces’, for analysis, which allowed for layering of individually coded elements of data into topic specific maps that attempt to display patterns, relationships, and trends in the social ecological system, from the perspective of TEK. In addition to producing maps which layered the collected TEK data, this project also attempted to integrate TEK data with existing data from the biological sciences. In producing the map series, for the purposes of comparison, layers containing MCH radio collar and calf capture data were successfully integrated with TEK data. Furthermore, because current scientific knowledge informs that the effects of climate change are likely intensifying the dynamics of caribou fluctuations and subsistence access across the North[vi], this project also had a goal to integrate scientific environmental change data with local knowledge of environmental change. While varying in scope and detail, over 55 years of TEK data on the ecology of the Mulchatna Caribou Herd and its habitat was obtained. The comprehensive project results can be viewed in a final report, which is available at http://www.subsistence.adfg.state.ak.us/TechPap/TP441pdf[vii]. The remainder of this article will summarize some of the prominent discoveries of the project, including: the overall distribution and abundance of the MCH, the MCH range expansion and population decline, TEK observations of environmental change, and adaptive considerations regarding hunter access challenges. A main line of inquiry was to understand local knowledge of caribou abundance over space and time. Terms like “scattered,” “small-bunches,” “lots,” “hundreds,” or “thousands” were descriptions often given by hunters in relation to specific scales of space and time which led us to identify two general categories of TEK described caribou abundance—Concentrated and Scattered. While local residents believe that there has always been the possibility of encountering scattered caribou throughout most of the MCH range, they also identified specific areas of caribou concentration which shifted over time. Local knowledge of MCH locational abundance for the decades 1960–1979 described the area of primary caribou concentration as the eastern portion of the range. 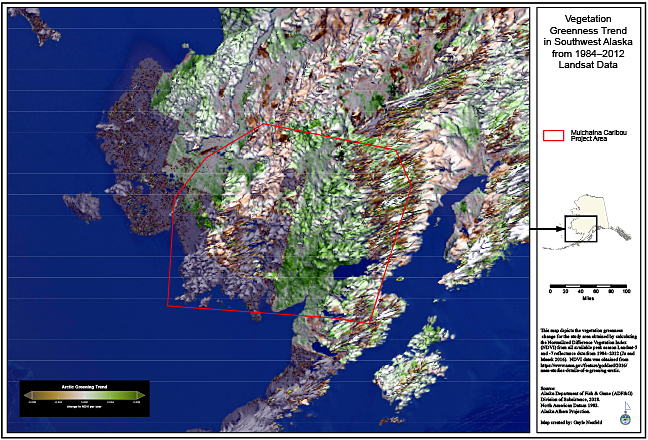 Where local observations of caribou occurred in the mountainous areas of GMUs 17A and 18 prior to the 1990s, they likely pertained to the Kilbuck Caribou Herd, a smaller, distinct herd, which was absorbed by the MCH during its later range expansion[ix]. Figure 2 displays kernel density, locational abundance data for radio-collared MCH caribou during the 1980s, overlaid by MCH abundance for this period identified by local knowledge. An MCH population trend graph appears in the upper, left-hand corner, with pertinent years highlighted in red. During the 1980s, local knowledge depicted a slight western, southern, and northern range expansion, which correlated with population estimates from the decade that showed the MCH population rising from around 20,000 caribou to around 60,000 caribou. The ‘concentrated’ category depicted by local knowledge lined up fairly well with the scientific knowledge. Although, there were some concentrated kernel density locations in GMUs 17B, 19B, and 18 which were not recorded by local knowledge, and other kernel density locations to the east of Lake Clark (GMU 9B), and even inside the boundaries of GMU 9A did not fall into the local knowledge category at all. As can be seen in Figure 3, both local and scientific knowledge depicted significant MCH population growth and range expansion to the west during the 1990s. Both data sets displayed large concentrations of caribou remaining in the east, but radio collar kernel densities for scattered caribou expanded well to the north and south of the mapped local knowledge boundaries. Both local and scientific knowledge displayed similar alignment during the 2000s and 2010s. Population estimates from the 1990s showed the MCH population rising dramatically from around 80,000 caribou in the early part of the decade to approximately 200,000 caribou in 1995, followed by a dramatic decline. By 2008 ADF&G biologists estimated that there were only about 30,000 caribou. Population estimates for this decade ranged from around 18,000 caribou in 2013 to over 30,000 in 2015. Interviews revealed that local knowledge views the MCH’s major population and range shift as resulting primarily from overgrazing and disease: the population grew so large that it didn’t have enough food, leading to an epidemic of hoof rot Sphaerophorus necrophorus. Respondents also discussed associated observations of declines in calving abundance and increasing predation by wolves. Liberalized hunting by nonlocal hunters during the 1980s and 1990s was frequently mentioned as also being a contributing factor. For about ten years they were [abundant] and then all of a sudden they started declining…I’d never seen that many caribou, there were too many. They got so big they ate up all the lichen [Cladonia spp.]. They overgrazed and they got some kind of hoof disease. It was [easy hunting]….We used to only have to go 30 miles, sometimes even 5 miles to get caribou, but not anymore. Some of the caribou habitat data mapped during this research reflected the overgrazing event described by interview respondents, who pointed out large areas of optimal tundra habitat in the eastern areas of the MCH range. Respondents frequently said that a richness of healthy lichen in the Mulchatna River watershed had allowed the herd to grow and expand during the 1980s and 1990s, but that this area became heavily overgrazed, leading the MCH mass to expand its range. Interviews revealed two types of caribou movement, normal seasonal movements and movement associated with range expansion. Local knowledge largely associated the patterns of MCH range expansion with population and overgrazing related dynamics. Interestingly, respondents from the eastern area of the range reported observations that during our current decade habitat conditions are improving in the formerly overgrazed areas and said that caribou populations were now increasing again as a result. [We are experiencing] warmer falls now, it never freezes as early as it used to…[and] it has been very mild and very rainy [during winter], the snow will get soft and then freeze and it all turns to ice. Spring time for us is usually considered April to May, but the last four years March has become the new spring. Snow is melting a lot faster in the spring now. All of the lakes are opening up quicker and thawing faster. Normally it would not happen until May, but now it’s thawing in March. Vegetation change in the study area was also a consistent theme in many of the interviews. These observations were centered mostly on expanding and taller-growing deciduous shrubs, and also early leaf-out in spring, and greening during winter. The last twenty years there is more brush…I believe we have a climatic change. It has gotten warmer and the brushes grow more. Up the river we never used to see brushes in the sandbars but now they’re all over. There are lots more brushes, the brushes are really tall now…The leaves are bigger the last few years and the berries grew earlier. [The] grass and leaves are now staying green longer than normal [and] sometimes in winter we’ve seen green, especially in the places where it hardly freezes....When it stays warm, all of sudden the grass grows back up. Areas of significant deciduous vegetation change were depicted by our respondents. These were mostly confined to riparian areas. The primary species mentioned were willow, followed by dwarf birch. We utilized Western science data on environmental change to compare with the changes local hunters and elders reported. Figure 4 is a view of southwest Alaska taken from the Greening of the Arctic trend map produced by Ju and Masek[x], which used Landsat data to depict the change in Normalized Difference Vegetation Index (NDVI) from 1984–2012. The NDVI data shown in the figure depicted significant greening in the eastern portion of the study area (highlighted by the red border) and aligns with the observations provided by local knowledge. We don’t really have so much brush that it is really changing the tundra much…the sloughs and river sides have grown more and more large willows. The meadows have only changed a little bit. Down towards the coast you can definitely notice that the habitat has changed a lot, but [upriver] tundra and moss have not changed, the country has stayed mostly open, the brush has not encroached everywhere. There is still plenty of nice tundra around here. According to local knowledge, rather than affecting caribou, the primary influence of vegetation change in the large-land-mammal subsistence system is increased moose abundance and increased moose harvest opportunity, especially in the southern portion of the study area. We’ve got lots of moose. Moose have become a lot more abundant. Now you can probably get a moose…but it’s much harder to get a caribou. [The] elders just used to talk about moose, [there was] not too much moose, but they used to see a couple of moose. But nowadays there’s a million moose. Local knowledge viewed increasing moose abundance to be a result of climatically driven habitat enhancement, centered on the expanding health and growth of moose’s favorite food: willows. Moose have been increasing because of the warm winters. There is better willows for feeding. Moose like to eat willows. Up sloughs and along the banks of the rivers is good feed for ‘em. The relationship between local observations of expanding deciduous vegetation and known moose use areas became apparent when we combined the GIS layers for these two datasets. For example, the Nushagak, Mulchatna, and Kvichak watersheds were considered prime moose habitat by local residents at the time of this study, and this region was noted as simultaneously experiencing expanding deciduous vegetation over approximately the last 25 years. 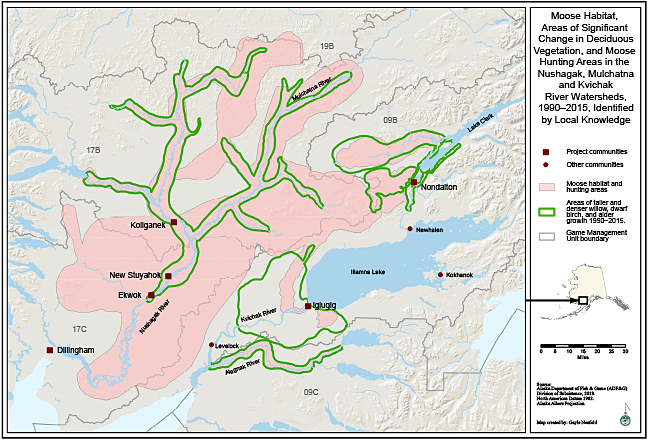 In Figure 5, the pink polygons represent known moose habitats and hunting areas according to local knowledge and the green-bordered polygons represent areas of expanding deciduous shrubs. Moose harvest data corroborated local knowledge observations that habitat change, which largely benefits moose, is occurring. Since the late 1990s moose harvests by local residents have increased significantly in the southern portion of our study area (GMUs 9B, 9C, and 17) and during the current decade, in the western portion (GMU 18). Scientific knowledge corroborates these local knowledge accounts. For example, a recent paper by Tape et al. [xi] has linked increasing range expansion of moose in Alaska’s tundra areas to warming, and increased shrub habitat. These various aspects of change have forced hunters to make adaptations in their behaviors and strategies in order to ensure they have access to important large cervidae resources. Many respondents said that caribou hunting often requires traveling too far to make it worth it these days and that moose are closer and more easily accessible than are caribou today. Prey-switching to rely more on increasing numbers of moose than difficult to access caribou has been one adaptive response[xii]. For the last four years we didn’t go winter hunting because the weather is too warm, too dangerous to cross rivers. Today we can’t travel in winter like we used to, there is always open water in creeks and lakes. It’s not freezing up. With the lack of snow, we’ve been relegated to only hunting caribou with skiffs in the fall. Winter hunts, [we] can’t get caribou now; no snow, no access, marginal snow conditions. Some years there has been barely enough snow, other years not enough…people got hardly any caribou. Also, the rivers have not been freezing so you cannot cross the [Wood] river to get at them. There can be snow, but if it’s warm and the rivers are not frozen it doesn’t matter if there’s snow. This project revealed TEK’s capacity to contribute to Western science and resource management. An important takeaway was that local knowledge has improved our understanding of the adaptive considerations Alaska’s subsistence large land mammal hunters’ face in relation to the effects of climate change. Based on this study, two of the primary considerations are access and prey-switching. It is hoped that the results of this project will influence other researchers to make efforts to monitor these variables and to utilize participatory landscape mapping, which has great potential as a mechanism for integrating scientific and local knowledge. [i] Ackerman, Robert E. 1996. “Kuskokwim Drainage.” In American Beginnings: The Prehistory and Paleoecology of Beringia, edited by F.H. West, 451–477. Chicago: University of Chicago Press & Gaul, Karen K. 2007. Nanutset Ch’u Q’udi Gu before Our Time and Now: An Ethnohistory of Lake Clark National Park & Preserve. Anchorage: U.S. Dept. of the Interior, National Park Service, Lake Clark National Park & Preserve. [ii] Boraas, Alan. 2004. “Dena’ina Prehistory.” Soldotna: Kenai Peninsula College. 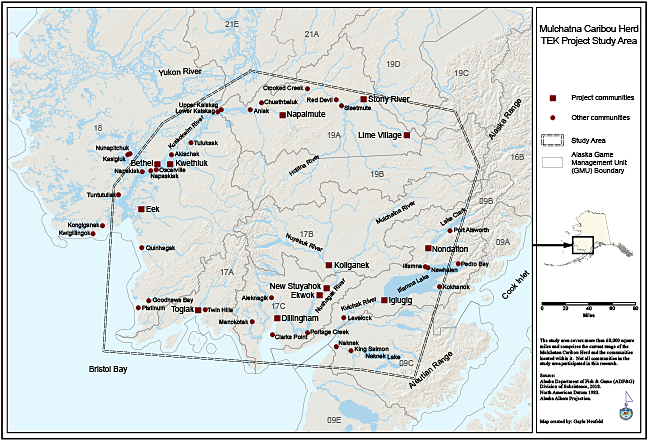 http://sites.kpc.alaska.edu/anthropology/files/2014/08/Overview-of-Denaina-Prehistory-2.pdf. [iii] Ackerman, Robert E. 1979. “Southwestern Alaska Archaeological Survey, 1978: Akhlun–Eek Mountains Region (Preliminary Report to the National Geographic Society).” Pullman, WA:Washington State University, Laboratory of Anthropology, Arctic Research Section & Fienup-Riordan, Ann. 2007. The Way We Genuinely Live = Yuungnaqpiallerput: Masterworks of Yup’ik Science and Survival. Seattle:[Anchorage]: University of Washington Press; in association with Anchorage Museum of History and Art and Calista Elders Council. [iv] Perry, Phillip. 2011. “Unit 18 Caribou Management Report.” In P. Harper, Editor. 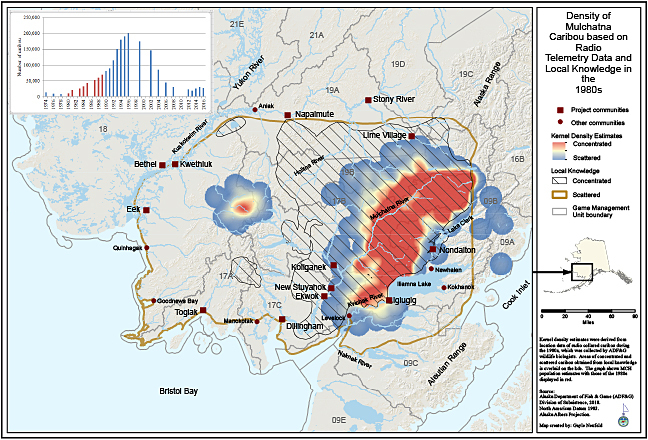 Caribou Management Report of Survey and Inventory Activities 1 July 2008–30 June 2010. 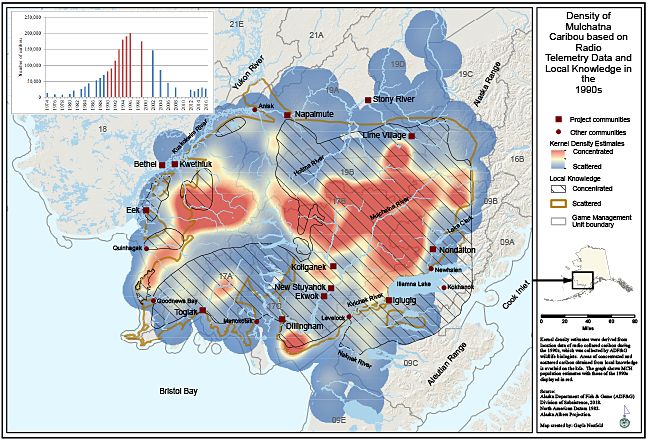 Juneau: Alaska Department of Fish and Game, Project 3.0. & Woolington, James D. 2011. “Mulchatna Caribou Management Report, Units 9B, 17, 18 South, 19A, and 19B.” In P. Harper, Editor. Caribou Management Report of Survey-Inventory Activities 1 July 2008−30 June 2010, 11–32. Juneau: Alask a Department of Fish and Game Division of Wildlife Conservation. [vi] Brinkman, Todd J. 2016. “Impact of Climate Change on Hunter Access in Alaska.” n.p. : Earth to Sky, http://www.earthtosky.org/content/webinars/Earth_and_Sky_Mar23_2016.pdf & Jandt, Randi, Kyle Joly, C. Randy Meyers, and Charles Racine. 2008. “Slow Recovery of Lichen on Burned Caribou Winter Range in Alaska Tundra: Potential Influences of Climate Warming and Other Disturbance Factors.” Arctic, Antarctic, and Alpine Research 40 (1): 89–95 & Joly, Kyle, David R. Klein, David L. Verbyla, T. Scott Rupp, and F. Stuart Chapin. 2011. “Linkages between Large-Scale Climate Patterns and the Dynamics of Arctic Caribou Populations.” Ecography 34 (2): 345–352 & Mallory, Conor D., and Mark S. Boyce. 2017. “Observed and Predicted Effects of Climate Change on Arctic Caribou and Reindeer.” Environmental Reviews, June, 1–13. [vii] Van Lanen, James M., Gayle Neufeld, and Chris McDevitt. 2018. Traditional Ecological Knowledge of the Mulchatna Caribou Herd: Phenology, Habitat Change, Subsistence Use, and Related Species Interactions in Game Management Units 9B-C, 17, 18, and 19A-C, Alaska. Alaska Department of Fish and Game Division of Subsistence, Technical Paper No. 441, Anchorage. [ix] Hinkes, Michael T., Gail H. Collins, Lawrence J. Van Daele, Steven D. Kovach, Andrew R. Aderman, James D. Woolington, and Roger J. Seavoy. 2005. “Infl uence of Population Growth on Caribou Herd Identity, Calving Ground Fidelity, and Behavior.” Journal of Wildlife Management 69 (3): 1147–1162. [x] Ju, Junchang, and Jeffrey G. Masek. 2016. “The Vegetation Greenness Trend in Canada and US Alaska from 1984–2012 Landsat Data.” Remote Sensing of Environment 176: 1–16. [xi] Tape, Ken D., David D. Gustine, Roger W. Ruess, Layne G. Adams, and Jason A. Clark. 2016. “Range Expansion of Moose in Arctic Alaska Linked to Warming and Increased Shrub Habitat.” Edited by Mathew S. Crowther. PLOS ONE 11 (4). [xii] Winterhalder, Bruce, and Eric Alden Smith, eds. 1981. Hunter-Gatherer Foraging Strategies: Ethnographic and Archeological Analyses. Prehistoric Archeology and Ecology. Chicago: University of Chicago Press & Fall, James A., Davin L. Holen, Brian Davis, Theodore Krieg, and David Koster. 2006. “Subsistence Harvests and Uses of Wild Resources in Iliamna, Newhalen, Nondalton, Pedro Bay, and Port Alsworth, Alaska, 2004.” Juneau: Alaska Department of Fish and Game Division of Subsistence, Technical Paper No. 302. http://www.adfg.alaska.gov/techpap/tp302.pdf & Hansen, Winslow D., Todd J. Brinkman, F. Stuart Chapin, and Caroline Brown. 2013. “Meeting Indigenous Subsistence Needs: The Case for Prey Switching in Rural Alaska.” Human Dimensions of Wildlife 18 (2): 109–123.